Mold is something that can be dangerous to many people. In fact, 1 in 4 people are genetically disposed to mold, which means the fungi makes them experience the symptoms of an allergic reaction. A stuffy nose, scratchy throat, and irritated skin are just a few of the health problems that can come hand in hand with the growth of mold. Infants are especially susceptible to experiencing health issues from mold. A study posted by Annals of Allergy, Asthma & Immunology links development of chronic inflammation in an infant’s lung airways to mold. This chronic inflammation can lead to wheezing, shortness of breath, tightness in the chest, and coughing. Check out this earlier post from our blog to learn more about the potential health risks accompanying mold. To begin, with this information in mind, it’s important to have mold removed as soon as you notice it. A sudden onset of allergic symptoms is the main indicator that mold may be in the home. Although, there’s other tell tale signs that mold is growing. Mold, when it’s growing indoors, has a very distinct smell. Depending on how severe the growth, mold can be scentless, but will have a scent if it’s there more often than not. The most obvious indicator of mold is the presence of mold you can see. It’s not uncommon for mold to pop up in places where it may look like a build up of dirt. Be be mindful of odd black, brown, or green discolorations. To learn more about the growth of mold, check out this post from our blog. With that being said, it’s important to know how to go about getting mold removed. Mold is an issue that should ONLY and ALWAYS be handled by professionals. With the removal of mold comes the risk of spreading the spores of mold around for it to grow more, but in a different location. 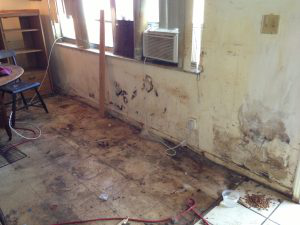 A professional mold removal company will know exactly how to handle the issue, and how to dispose of objects that have been victim of mold growth. Make sure to check the credentials, including licensing and insurance specifics. A good mold removal company should be accredited by the IICRC, and should have a license number to prove this. Never hire an unaccredited mold removal company. Nonprofessionals may not know the proper procedures for handling items that have been exposed to mold. Finally, a homeowner should never attempt to remove mold on their own. Online, there’s many guides with misinformation on how mold should be handled. The health hazard that mold presents should be taken very seriously, and attempting to remove it yourself is not a good idea. Depending on the area afflicted, entire areas of your home may have to be disposed of. For example: when mold grows on a wall, it has most likely seeped into that wall, and that wall must be removed entirely to fully stop the growth of mold. If your home has experienced the growth of mold, you must call a professional to handle the removal and clean up properly. Restoration USA is a fully certified disaster restoration company located in Pompano Beach. We restore water damage and fire damage. We also perform mold removal and leak detection, in all of Broward county. Most of the services we perform can be paid for by standard home owner’s insurance. Call us, toll-free, 24/7 at (866) 745-6428 or visit us online to schedule your free evaluation. 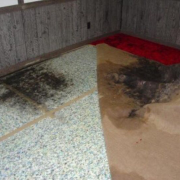 Why You Should Have Mold Removed By A Professional Mold And Mildew: What’s The Difference?